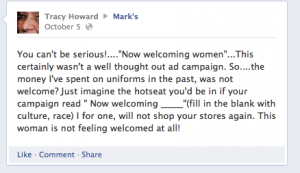 This Magazine → WTF Wednesday: Mark’s Work Wearhouse is “Now Accepting Women”? Ladies, rejoice! We’re now allowed inside Mark’s Work Wearhouse! In a recent rebranding effort, the Canadian Tire-owned retailer Mark’s Work Warehouse has changed its name to just “Mark’s”—oh, and they’ve also written one of the worst ad slogans we’ve seen in a while. Posters showing sophisticated, smiling women with the tagline, “Now Welcoming Women,” have sprouted up all over the Greater Toronto Area, which is where the campaign is focused on right now. The first location to drop “Work Wearhouse” from its name was the Edmonton flagship store in 2008, and the company has slowly been trying out the revamp in select locations since then, according to a Strategy article. The retailer has also changed the look of stores and the merchandise inside to focus more on women and casual menswear, the article reports. This is all fine and good. Rebranding is a major part of a clothing store; a natural progression and realization that vendors must change along with the societies they inhabit. However, the tagline that Mark’s chose to use is taking about 10 steps backwards. First of all, Mark’s has been offering clothing for women since its establishment in 1977. This new slogan suggests women weren’t allowed in Mark’s for its first 35 years of business; as if now that it’s been announced, women should be jubilant that they are finally welcome inside its doors. The issue is not that Mark’s wants to release a campaign that focuses on women and aims to bring a greater female presence to their stores; it’s how they chose to word it. As Colleen Westendorf (organizer of SlutWalk Toronto) wrote for the Huffington Post Canada blog, if Mark’s slogan said something as simple as, “’New women’s lines,’ or, ‘More women’s clothing than ever!’ nobody would have a problem. Whatever made the company choose to go with this campaign (by MacLaren McCann), is extremely puzzling. This whole thing is reminiscent of when Bic released special pink and purple lady-specific pens. The difference there, though, was that at least “Bic for Her” made for some hilarious Amazon reviews. As for Mark’s, it seems as though most women are just plain angry—and feeling anything but welcome.